Part of the new Labor campaign launching today. The campaign that caused irreparable damage to Malcolm Turnbull's government at the last election is being revived a week before the Budget. In 2016, Labor told voters it would "save Medicare" from the government's supposed plans to incrementally privatise the system - something Mr Turnbull repeatedly and explicitly promised he would not do. A post-election poll by JWS revealed just how effective the campaign was. Thirty-eight per cent of voters said Medicare's fate had been a key factor in their decision. Among those who made up their minds late in the campaign, that number was even higher. 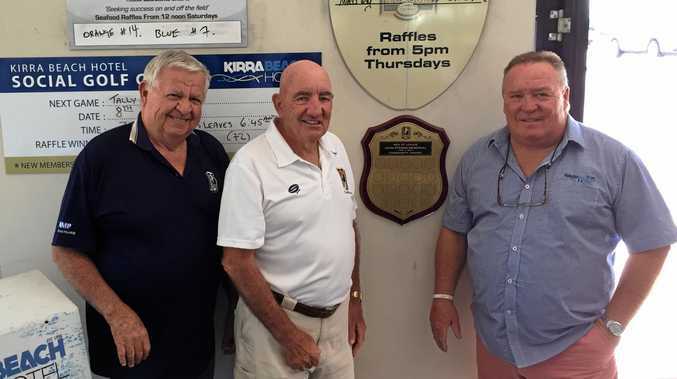 It helped drive a large swing towards Labor at the election, which ended with a two-party margin of less than 1 per cent, and the government's majority reduced to a single seat. Now, with Scott Morrison poised to call a fresh election within weeks, Labor is refocusing on Medicare as a political issue. It is promising to end the Medicare rebate freeze in its first 50 days, should it win power. What does that mean, exactly? Here is the context. When you see your GP, a specialist or another medical practitioner, certain services are subsidised by the government. If your doctor bulk bills, they directly charge the government for whatever service they provide you. They are paid a set amount - for example, the Medicare rebate for a standard GP consultation is about $37. The size of that rebate is meant to rise every year to keep up with inflation, in a process called indexation. But thanks to the freeze, the rebate for many services has not risen since 2014. Your doctor is being reimbursed the same amount now as they were five years ago. The danger is that GPs will compensate for that loss of income by charging some patients more, and indeed, patients' out-of-pocket costs for visiting the doctor have increased from an average of $28 at the end of 2013 to $36.50 in the September quarter last year. Both major parties have contributed to the issue. The freeze was first introduced by Labor in 2013 as a budget savings measure, and has since continued under Tony Abbott, Mr Turnbull and Mr Morrison. It is saving the government billions of dollars, but was always meant to be temporary. Mr Morrison plans to end the freeze on July 1, 2020. Labor's new proposal is to end it 12 months earlier than that, on July 1 this year. It would mean a quicker resumption of indexation for services like family counselling, urgent after-hours care, mental health care and counselling for pregnant women, all of which currently remain frozen. Labor says the change would cost the budget $213 million. 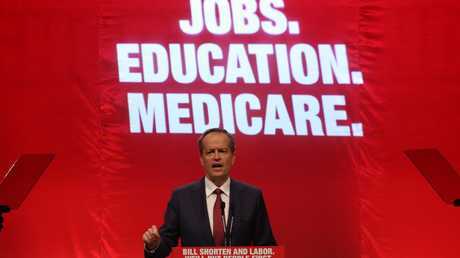 "The future of Medicare was at the top of my plan in the last election, and this election will be no different," Bill Shorten said. "Every day Mr Morrison's Medicare freeze stays in place is another day that families are paying higher out-of-pocket costs to visit the doctor. "If I'm elected prime minister, I won't waste any time stopping Mr Morrison's cuts to Medicare. His Medicare freeze will end in my first 50 days. "I believe access to quality health care should depend on your Medicare card, not your credit card." This whole conversation might sound familiar. 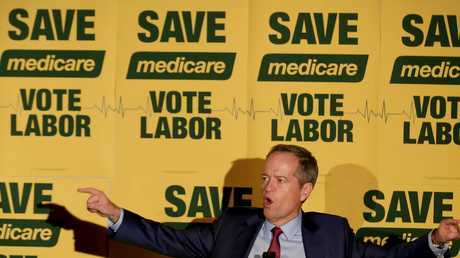 Labor also promised to end the freeze before the last election, as part of its controversial "save Medicare" campaign. 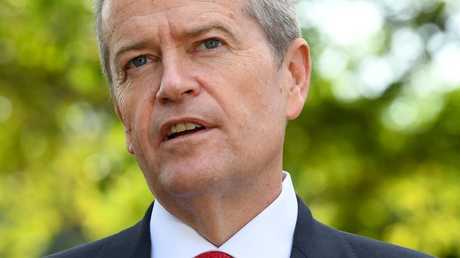 Mr Shorten's claim the Coalition was planning to privatise parts of Medicare infuriated Mr Turnbull, who was eventually moved to pledge Medicare would "never, ever, ever be privatised" - but the then-prime minister had been too slow to react. Even after he labelled it a "disgraceful" lie, the issue continued to haunt him. "The Liberals ran dead on it. It had been running for nearly two weeks of the election campaign by the time they actually stood up and started fighting back, and by that point it was too late. It was already kind of an accepted truth in voterland," Nicholas Reece, a Principal Fellow at the University of Melbourne and host of the Sky News program PoliticsHQ, told news.com.au. "You've got to hit back hard and fast. You cannot let it take hold in the public mind. That was a critical failure." 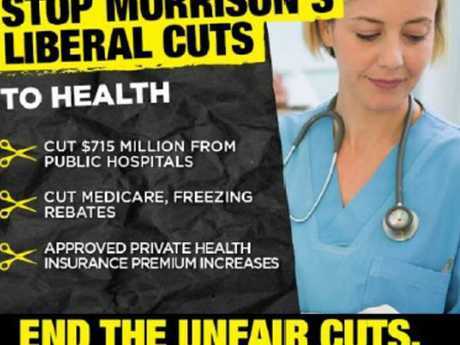 The Mediscare campaign struck voters as plausible because it played into their existing fears about the Liberal Party, which is generally seen as more likely to cut health spending or privatise government assets. On top of that, Labor's advertising campaign featuring former prime minister Bob Hawke was well planned and designed. Today's renewed pledge to end the Medicare rebate freeze coincides with another PR blitz, which Labor hopes will be equally effective. 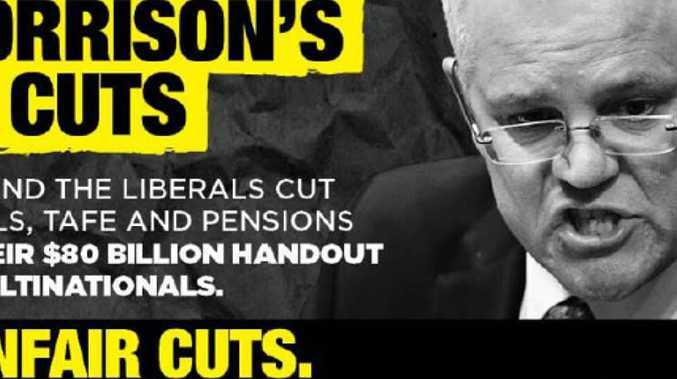 The Opposition is distributing leaflets to voters' mailboxes attacking what it calls "Morrison's Liberal cuts" to health, schools and pensioners, along with the business tax cuts the government tried to pass when Mr Morrison was treasurer. Labor's attack also includes posters, a public petition and social media images. The election might be weeks away yet, but the campaign has already started. 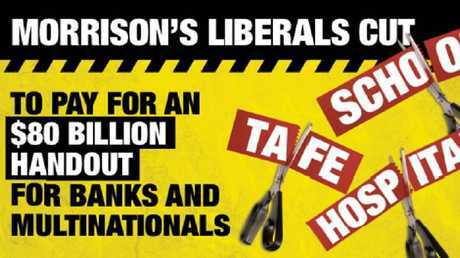 Part of Labor’s new campaign. One of the images you’ll see on social media.